All I can say is, this is worth the $5.99 you'll spend for the mix. Worth every penny. This could not be easier to make - all you need are the normal cake mix side ingredients: eggs, oil, and water. 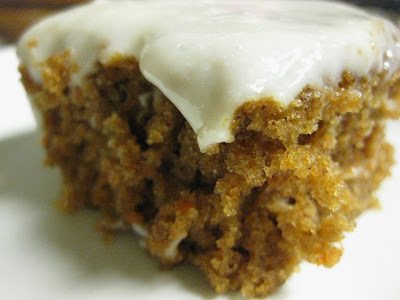 And if you want to turn it into a carrot cake, all you have to do is shred or process a cup (or more) of carrots and toss them into the mix. You could do the same with shredded zucchini. I bet this would taste great with shredded or diced apples, too. If you like raisin, nuts, or coconut, throw some of those in. It's a very versatile cake mix, and I swear, everything I've tried from Namaste has come out absolutely perfect and has been a crowd-pleaser. I made this cake for my book club this weekend, and everyone loved it! You really can't tell that it's gluten- and dairy-free, and no one else will either, if you don't tell them. 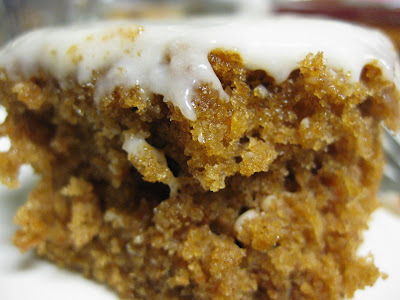 I'm putting the (very loose) recipe for the icing that I made below, and if you're a coconut fan, consider sprinkling some over the icing when you make it, perhaps along with just a little bit of cinnamon. But just buy this mix. Do it, now. You won't regret it. 1 8-oz. package Tofutti "Better than Cream Cheese"
Mix the Tofutti "cream cheese" and Earth Balance together first well, eliminating all the lumps. Add the powdered sugar a little at a time, and then add the vanilla and soy milk to your own taste. Then add the tapioca starch (it doesn't clump too much, but you might want to sift it for consistency's sake) and mix very well together until you have a nice, smooth, and creamy mixture. Cover and chill in the refrigerator for about 1 hour to let it thicken before spreading it on the cake. Sprinkle coconut over the top of the cake, if desired. Hey, I'm convinced. Where do you get the Namaste cake mix? I'd love to try it! Hi Sandra! You can find Namaste cake mixes at Whole Foods and Dierbergs, and I've seen them at a few natural food stores in St. Louis as well (The Natural Way in Webster Groves has them). Good luck, and I hope you enjoy it!